Digital signage has truly become part of the environment that surrounds us, bringing just one more dimension to the digitised world we live in. Some estimates put the global market for digital signage at over $20bn by 2020 - and it’s growing at up to 40% year on year between now and then (source: Signage Live). For almost any industry segment you can think of, there’s an application for digital signage – with perhaps the most clear two areas being retail and transportation. Digital signage has become a powerful tool in the retail world where digital information displays are used in store for branding, promoting products and entertaining customers. In the transportation sector, hubs, links and vehicles provide the opportunity for advertising alongside the need for up-to-date information on schedules and delays. For example, Transport for London (TfL) is trailing e-paper displays as bus stop timetables which can be remotely powered and updated using on solar energy. High information digital signs typically use glass liquid crystal displays (LCDs) today – a mature technology that is available up to very large sizes (think of 84" bus stop digital screens) with great screen performance: video rate and the ability to reproduce high quality colour. For outdoor use, brightness is a key factor in overcoming daylight – and LCD can respond to this with the use of brighter backlights (high dynamic range displays). Regardless of which type of glass display technology is used, for larger signs the display becomes very heavy and in need of strong supporting gantries or frames. This limits where and how glass displays can be installed into and onto buildings and objects. For smaller displays the fragility of glass, combined with lack of flexibility limits the choice of surface that can be used to mount the display, for example on vehicles, bicycles or around pillars and posts. 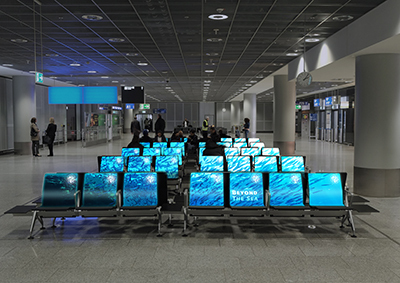 Flexible display technology, which uses plastic instead of glass, brings several functional and technical benefits to digital signage. 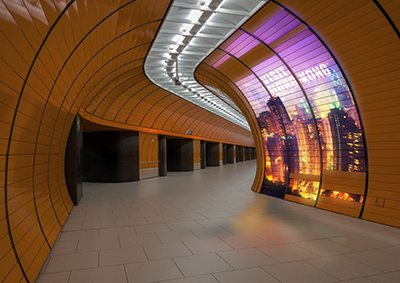 A particular kind of flexible display known as organic LCDs (OLCDs) provide all of the benefits of LCD for advertising in terms of brightness, colour performance, cost and video-rate capability, but with the clear advantage of being glass-free, thinner, lighter and conformable around surfaces. This will allow for even larger displays to be conformed to the shape of buildings, vehicles and other surfaces in our daily lives. 40 years ago, advertising giant JCDecaux pioneered the concept of street furniture by designing and installing bus shelters at their cost in return for the right to display commercial advertising on the side. Taking this idea forward, it may not be too long until we see almost any surface furnished with a flexible display. If you want us to qualify our flexible display technology for your application, please get in touch with us at info@flexenable.com.